Use social media to detect incidents in your region. Create a situational overview of an incident quickly. Incidents are widely reported on social media, often by eye-witnesses, using text and photos. Detect incidents by location or incident type. PublicSonar is designed for risk, crisis and business continuity management. Our tools will give you an instant overview of any situation. In the aftermath of a crisis, you can evaluate the course of events and assess the effect of your measures using historical data. Social media are widely used in emergencies. Witnesses report what they see by sharing pictures, videos, text. That makes social media a valuable source during incidents. Time is critical. Creating a situational picture should be fast and easy. You don’t have time to build complex searches. You don’t have time to process large volumes of meaningless chatter. This is why you need a tool. For collecting, analyzing, visualizing and sharing information. This tool should fit seamlessly into your incident management process. 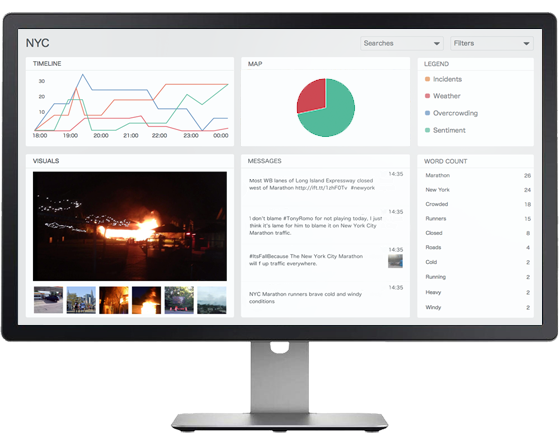 Detect all the incidents in your region with your real-time incident dashboard. Information is categorized based on relevance and theme. This will save you time processing thousands of online posts, when only a small part is truly relevant.